Within a year, the world’s current largest single-dish radio telescope, the Arecibo Observatory in Puerto Rico, will lose its title. 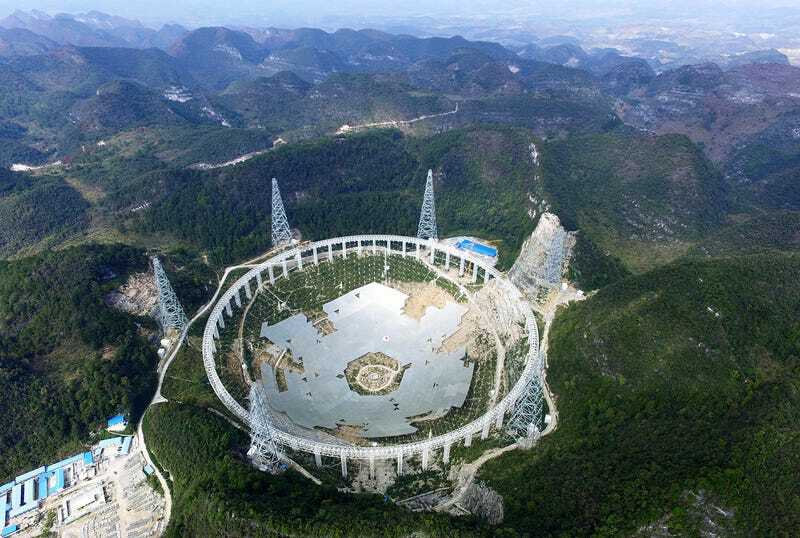 It will instead be usurped by this: the Five hundred meter Aperture Spherical Radio Telescope (FAST) in Pingtang County, China. As you can see in this photo taken on November 26th, the construction is well under way. Right now workers are installing the 4,400 triangular reflective panels to the gigantic steel frame that sits in a a natural basin. FAST is expected to be completed in September 2016, when it will be the largest and most sensitive radio telescope on Earth—three times more sensitive than the Arecibo Observatory.